Something to watch is how well new religious parties do. 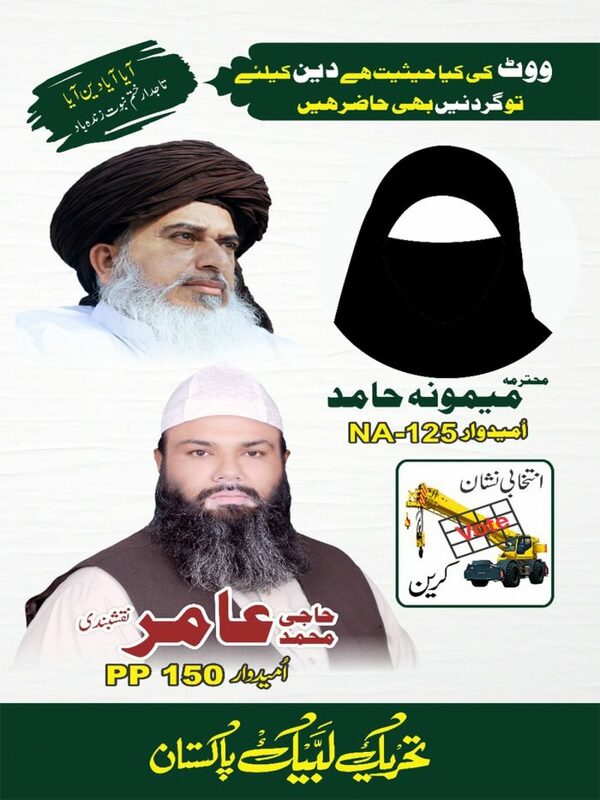 One of them, Tehreek-e-Labbaik Pakistan, has a campaign poster that features a woman candidate, although you will need a little imagination to see her. I understand (via experts on Twitter) that there could be many by-elections in the weeks to come. One even spoke of a “wave” of them. Some of these will be mandated by a provision that invalidates any constituency result in which at least 10% of women on the voter roll did not participate. Others will be necessary because candidates can run in multiple constituencies and, if they win more than one, they have to step aside in all but one. Still others will be needed because several candidates (at least 8) have died since nomination; it is not clear to the extent the deaths are natural or due to election violence. The electoral system is mostly FPTP. The total size of the National Assembly is 342, and 272 of them are from single-seat districts via plurality. Others are reserved for women or ethnic minorities; some form of PR is supposedly used for these, but I do not have the details. Perhaps someone will enlighten us in the comments. This election is the first under a newly delimited constituency map. Early results put Pakistan Tehreek-e-Insaf, led by Imran Khan, in the lead. Unless I say so explicitly, mention of parties or candidates on this blog is not an endorsement. That is especially so when I have no clue what a party’s poster appearing with my entry even says! Lebanon votes on 6 May. The new electoral system was previously profiled here at F&V by Amal Hamdan. Now we get to see the system in action! Another change is that the interior ministry will be solely responsible for ballots on election day. In previous elections, ballots were handed to voters by campaigners for various political parties. In past elections, less popular candidates were able to slip their names onto the lists of other parties in a phenomenon known as “booby-trapped ballots”. Lebanon, welcome to open alliance lists! Lebanon’s election is coming up (6 May), and the country is getting its first look at a new open-list proportional electoral system (profiled previously here by Amal Hamdan). An interesting blog post from 12 March by Gino Raidy has just come to my attention*: “Why Political Parties are Terrified of Forming Lists”. The author discusses the perils for parties joining on an alliance list. Because the lists are open, it is possible for one party to help boost its partner’s seats but elect none of its own candidates. On the other hand, it is also possible that parties (and alliances) will want to recruit relatively independent figures who can appeal to a wider electorate. These sorts of issues may be new to Lebanon, but they will be familiar to readers of this blog. I have talked about them before, most recently in a discussion of Brazil and Finland, where open alliance lists have been in place for some time. In May 2018, parliamentary elections are scheduled to be held in Lebanon using a PR electoral system for the first time. The last parliamentary elections in Lebanon were held in June 2009. Since then, parliament has extended its own term twice. After years of deadlock over electoral reform, Lebanon’s two main rival political alliances, the March 14 and March 8 blocs, passed a law in June 2017 abolishing the Block Vote [MNTV–ed.] electoral system, used since 1958 for legislative elections, and introduced Open List Proportional Representation (PR) (Law No.44). An analysis of key technical aspects of the new law – namely, the formula used to distribute seats to lists and an informal threshold for list eligibility – suggests that it was designed to enhance the chances of candidates within the March 14 and March 8 blocs to be elected and diminish the possibility of electing candidates outside these alliances. Lebanon has been politically polarized between the March 14 and March 8 blocs since 2005, following the assassination of former Prime Minister Rafic Hariri which led to an end of Syria’s hegemonic grip over Lebanese politics. The main political factions comprising the March 14 alliance are the Future Movement (FM), the Sunni community’s main political representative; Maronite Christian Samir Geagea’s Lebanese Forces (LF); and the Christian Kataeb party. The March 8 bloc comprises the main Shia political parties, Hizballah and the Amal Movement and their mainly Maronite Christian ally, the Free Patriotic Movement. Until 2009 Druze leader Walid Joumblatt’s Progressive Socialist Party (PSP) was also part of the March 14 bloc but has since withdrawn, further reinforcing Joumblatt’s ability to play political kingmaker in Lebanese politics. 128 parliamentarians will be elected in 15 new ‘major’ electoral districts. Many, but not all, of these 15 districts are comprised of minor constituencies [qada]. Each voter casts a ballot for a list of candidates; voters have the option to cast one preferential vote for their favorite candidate, as long as the candidate is on the same list they have chosen. There is a key restriction on candidates’ preferential vote: if the major electoral district is comprised of more than one minor constituency, voters can use their preferential vote only for candidates within their minor constituency, and not any candidate in the major electoral district. The new electoral law adopts the Hare Quota Largest Remainder (HQLR) formula to distribute seats to lists. Under the HQLR, the ‘price’ of a seat, in the currency of votes, is determined by dividing the total valid votes cast in a district by district magnitude (number of seats allocated in the district). This provides the quota or price of a seat. Under Lebanon’s PR system, for every whole quota a list has won, it receives a seat. If there are unfilled seats, they are allocated to lists with the largest remaining votes. Only lists that receive one full whole quota are eligible to seat allocation; any lists that receive less than 1.00 or a full simple whole number are disqualified. One full whole quota or the threshold for lists to qualify for seat allocation varies across districts from 7.69% of votes (Mount Lebanon 4) to 20% (South Lebanon One). Table 1.1 identifies the major constituencies and the effective threshold in each district for lists to qualify for seat allocation. The minor constituencies or qada within each major district are in brackets. To calculate the threshold for a list to qualify for seat allocation, the total number of valid votes cast for all lists in the South One district are combined and divided by district magnitude. Assume there are three hypothetical lists competing in the South Lebanon One district. The number in the brackets next to each candidate indicates the candidate’s preferential votes. The first step is to calculate whether lists are eligible to qualify for seat distribution; only those with at least one whole quotient will be eligible. List A: 73,917 list votes ÷ 34, 382 electoral quotient = 2.15. List B: 64,826 list votes ÷ 34, 382 electoral quotient = 1.88. List C: 33,168 list votes ÷ 34, 382 electoral quotient = 0.96. Since List C won less than one whole electoral quotient it is disqualified – even though this list won 19.29% of total votes cast. Since a list has been disqualified, a second electoral quotient using the HQLR formula must be calculated to distribute seats to eligible lists. Formula for second quotient: Qualifying Lists’ Votes ÷ District Magnitude. Second Quotient: (73,917 List A votes+ 64,826 List B votes) = 138,743 ÷ 5 seats = 27,749. The price of a seat dropped from 34,382 to 27,749 votes. Arguably, the provision to calculate the price of a seat twice is aimed at lowering the cost and enhancing the March 14 and March 8’s blocs chances of sharing seats (presuming these alliances remain in tact). Step 4. Distribute seats to qualifying lists. This is determined by dividing the qualifying lists’ total votes by the second electoral quotient. List A: 73,917 ÷ 27,749 = 2.66 = 3 seats. List B: 64,826 ÷ 27,749 = 2.33 = 2 seats. The next step is to distribute seats to candidates. Seat distribution to candidates across lists will not be straightforward in Lebanon since PR will be implemented alongside a confessional quota. The next section demonstrates how implementing a PR electoral system alongside a confessional quota will likely lead to anomalies in seat distribution and consequently, anomalies in representation. Lebanon is comprised of 18 officially recognized religious communities, known in Lebanese jargon as confessions or sects. These 18 sects are mainly Muslim and Christian denominations, although there remains a small Jewish minority. None of these 18 confessions are a majority, making Lebanon a country of minorities. All 128 parliamentary seats are reserved for 10 Muslim and Christian confessional communities. One seat is reserved for ‘minorities’, meant to represent the remaining communities not designated seats. To distribute seats to candidates in qualifying lists, each candidates’ percentage of preferential votes is calculated; then all candidates are ranked in a single list from highest to lowest percentage and seats are distributed accordingly. However – seat distribution will also need to take into account the confessional allotment of seats and their allocation to minor constituencies: if all the seats reserved for a confession have been filled, a candidate can be disqualified even if he or she is ranking higher than their opponent. A candidate may also be disqualified if all the seats allotted to their minor constituency have been filled. Drawing on the hypothetical example from the South Lebanon One district where List A won 3 seats and List B won 2 seats clarifies these points and demonstrates how potential anomalies in representation could arise in Lebanon’s new PR electoral system. Step 1. Calculate each candidates’ percentage of preferential votes. % of Preferential Votes: Candidate in Qada ÷ Total preferential votes for all candidates in qualifying Lists in Qada. The following table calculates candidate’s percentage of preferential votes in each minor constituency in the South Lebanon One electoral district. Step 2. Rank all candidates from both constituencies from the highest percentage of preferential votes to the lowest. Step 3: Distribute seats to candidates. once the seats allocated to a list have been filled, the remaining candidates for that list are disqualified, even if they have higher percentages of preferential votes from other lists. If candidates are tied for preferential votes and are both eligible because the confessional quota in their district hasn’t been filled, the older candidate wins the seat. This demonstrates exactly the potential anomalies in representation under Lebanon’s new PR system: although the candidate in rank 5, Maronite Candidate B4 won 20.36% preferential votes, he or she was disqualified because List B’s two seats had been filled and consequently, the seat was awarded to the candidate in rank 7, Maronite Candidate A3, who received 16.54% of preferential votes. The candidate in rank 6, Sunni B1, was also excluded because all the Sunni seats in Sidon were filled; even if they had not been filled, List B also already been allocated its two seats. Lebanon finally has rewritten its electoral so that parliament can be renewed in 2018 (the sitting parliament was elected in 2009). The best explanations I’ve found so far are on Blog Baladi, Moulahazat, and Executive Magazine. Until I’ve found a translation of the text of the law itself, I have to rely on these sources. 1. Lebanon makes a major electoral system change by changing from multiple non-transferable vote (MNTV) to (open) list PR with average magnitude of 8,5 (128 seats in 15 districts, range 5 to 11). It’s in line with a more general trend: many countries once started with MNTV but when elections become more partisan, search for ways to make the outcome less risky. One way to do this is to reduce district magnitude, with many countries ending up with M=1 (FPTP). In Lebanon the endpoint was the qada as district (law of 1960 and Doha law of 2008: 26 districts). Designing even smaller districts is too difficult given the predetermined allocation of every seat to a specific religious community. The districting still bears the mark of majoritarian thinking: they avoided merging districts that differ too much in their religious makeup. Specifically, they have chosen single quota largest remainder as allocation mechanism between lists. The quota is also threshold and the quota is recalculated with the vote total of the lists still in the running. 2. The intraparty allocation of seats to candidates is rather complex because they combine proportionality between parties with the prefixed allocation of seats to religious communities and to sub-districts (= nada). A voter is not restricted to candidates of his own religious community but can only give a personal vote to a candidate of his sub-district. It’s unclear to me if a voter has the option of a list vote without a personal vote for a candidate of that list. All candidates (irrespective of their list or their religious community & sub-district) are ordered according to their personal vote share in their sub-district (not the absolute number of personal votes to balance sub-districts of different sizes). Seats are then awarded one by one to the candidates in that order. As soon as a list is awarded all its seats, all lower candidates of that list are defeated and as soon as a religious community & sub-district is awarded all its seats, all lower candidates of that religious community & sub-district are defeated. Or put in another way: a candidate loses if enough higher placed candidates of his list have already won to fill the vacancies of that list or if enough higher placed candidates of his religious community & sub-district have already won to fill the vacancies of that religious community & sub-district. The Venice Commission has published an generally positive opinion on the Georgian government’s proposal for constitutional reforms. The reforms were proposed after the governing Georgian Dream party won 115 seats in the 150 member legislature in elections, slightly more than the three-quarters majority required to amend the document. Specifically, the amendments propose repealing direct elections to the Presidency, replacing it with election by a 300-member electoral college composed of members of the national legislature and local councillors. In addition, most of the powers of the Presidency are stripped. This creates a parliamentary system, with a Prime Minister only removable through a constructive vote of no confidence. The previously unicameral legislature will be replaced, nominally, with a bicameral legislature, comprised of a Senate and a Chamber of Deputies. However, the Senate specifically includes members elected from Abkhazia, currently under the control of a separatist government, and is only to be created after “appropriate conditions have been created throughout the territory of Georgia”. This would seem to imply that the chamber can only be created when Abkhazia returns to government control, and the Venice Commission’s report confirms that they understand its creation will be delayed. In addition, there are changes to the electoral law. The existing mixed-member majoritarian system with a roughly even split between single-member constituencies elected using the two-round system and party-list PR with a 5% threshold will be replaced with a system of list PR only, still with a 5% threshold. While there is little elaboration, the document does specify that seats shall be allocated by the Hare quota, but instead of allocating seats by largest remainders, all remaining seats are allocated to the largest party (a method used in Greece in one of their endless electoral system changes). The change bears some resemblance to the relatively recent amendments in Armenia. Like Georgia, a semi-presidential system with a legislature elected with a mixed-member system transitioned into a parliamentary one with a legislature elected under a list system with a bonus (though Armenia’s bonus is somewhat more elaborate, and guarantees a majority government in one form or another). While drawing broad conclusions off two examples is obviously bound to be, these two results may suggest that there is a shift away from politics centred around an all-powerful directly elected presidency, and towards more party-based politics. A more tenuous argument along these lines could be made in relation to the electoral system. In both cases (along with Kyrgyzstan, which actually moved from single-member districts to MMM to party list), a system in which individual candidates were an important part of legislative elections (especially in the years shortly after independence) has been replaced by a system in which parties are the dominant actors. On the other hand, the pendulum has moved the other way elsewhere in the region, in Russia and the Ukraine. The President, though endorsed by the Georgian Dream party at the 2013 election, does not appear to have been overly enthusiastic about the landslide victory. The Venice Commission did express some concerns about the power of a government with an overwhelming parliamentary majority, but that seems less likely in Georgia than in Armenia, owing to the more proportional system.